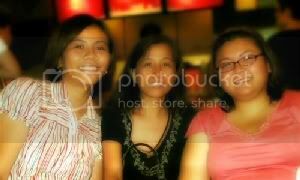 Here's a photo of us ( Suzanne, meand Liz) at Starbucks Glorietta when we met last year after Christmas for the 1st time. Suzanne is the one who introduced me to design for the Scrapping Garden, while Zanne and Liz where already friends online for over 2 years now. We are all part of the Scrapping Garden, me at the Design Team while them at the Admin. Team. Zanne came all the way from Cotabato to spend Christmas in her inlaws and when i heard she's going to meet with Liz, i joined them. It was fun meeting them for the 1st time. Also met Liz's cool dad , husband, and Wesley (Zanne's hubby). We ate at Dad's courtesy of Liz's dad.